Think about the number of photos squirreled away on your hard drive--or across multiple drives, for that matter. If you’re an average user, it’s probably in the many thousands. Finding those images can be a challenge, though, which is where ACDSee Pro Version 3.0 comes in ($170, upgrade $90; prices as of February 8, 2010). ACDSee has completely redesigned its image management software’s interface, paying special attention to a photographer’s workflow and image editing. The company has improved the online options and functionality, too. The redesigned tabbed interface now conforms to what has become standard in asset management software, as it's divided into four functionality areas that are similar to the steps in a typical workflow: Manage, View, Process, and Online. Manage mode is where you import, organize, keyword-tag, rate, batch-process, search for, and compare images. As in the previous version of ACDSee Pro, keywording, rating, and organizing all work smoothly and easily; searches are quick and savable. The batch processing remains a convenient, simple-to-use function, and includes batch-developing, file-format conversion, renaming, and so forth. Unfortunately, Compare, which allows you to choose among similar images and tag them with a checkmark for further consideration, is a separate window. Since the other Manage functions are not available in the Compare window, you can’t rate or keyword-tag images as you compare, which can hamper efficiency and slow down your workflow. The View mode provides tools for inspecting your images at higher zoom levels than what's available in Manage; it also allows you to watch a quick slideshow of selected pictures. Here, you can play movies and add sound to your images, too. Similar to the separation of the Compare window from the main Manage mode, the division of the View and Manage modes seemed counterintuitive to us: When we manage, compare, and sort our images, we prefer to have full zooming capabilities, along with all the organizing tools. In View mode, you do have the ability to use the same caption, rating, and tagging tools as in Manage, which is a major help. But it would be much more useful if ACDSee were to combine the functionality of Manage, Compare, and View into a single tab. The Process mode now has two edit methods: Develop, which is nondestructive (meaning that it won’t affect the integrity of your images), and Edit for pixel-level adjustments. Develop (an expansion of the program’s RAW processing from previous versions) is further divided into tabs for Tune (to adjust exposure, tone, and color), Detail (for sharpness and noise reduction), and Geometry (to handle lens distortion, rotating and straightening, perspective, and crop). Any changes you make in Develop are saved separately from your original image, protecting the original. Whenever you open a previously edited image in ACDSee, your Develop settings will be loaded in; however, you can revert to your original at any time. The Edit section of the Process tab includes such tools as Selections, Red Eye, Add Watermark, and Special Effects, as well as pixel-based Exposure, Tone Curves, White Balance, Sharpen, and Color adjustments. If you revert to your original (or to your Developed image) after using the Edit tools on any file other than a RAW image, the software will discard all modifications you made in Edit (unless you save the Edited image in a separate file). All adjustments in both Develop and Edit display on the image immediately, with no time lag. We were particularly impressed with the new Advanced Color tool (which is available in both the Develop and Edit sections). With Advanced Color selected, click anywhere in your picture--that will automatically choose the color values directly under your cursor. Then drag up or down to increase or decrease the saturation, brightness, or hue of all similar pixels in your image. 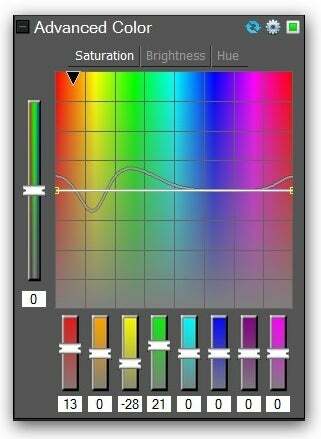 Alternatively, you can select specific colors in the spectrum, choose saturation, brightness, or hue, and use the tools in the dialog box to make the adjustment. For instance, in our test image, we heightened the saturation of green leaves, and deepened the reds in painted planks, without affecting any other color values in the image. The resulting curve tends to be gentle, affecting similar values, so that the changes in the image usually appear natural rather than overly dramatic (depending on your edit choices). Surprisingly, the Online mode tab isn’t where you go to save your files for the Web or otherwise share them. Instead, it’s a window into the ACDSee Online service for sharing and archiving your photos. (You get 2GB of storage on ACDSee Online with your purchase of the program.) The full range of online tools are available in the File drop-down menu in the other three modes. For instance, that’s where you’ll find the Send tools (for e-mailing or uploading to the Web), though they vary slightly, depending on the mode. In Manage, you can send several images, but in View and Process, Send works only on the currently selected picture. As capable as ACDSee Pro is, the software can be intimidating to the novice user; learning how to make it work for your particular workflow may take some trial and error. The company provides guidance, at least: The opening splash screen (which you can turn off) is a QuickStart Guide that offers a helpful albeit cursory explanation of the interface, and ACDSee’s Help menu provides lots of information about what various features and tools are (but little advice or step-by-step instructions on how to use them). Version 3.0 isn’t without its flaws; rather, in our experience, the software is uneven in concept and execution. For instance, the Process mode is smooth, deep, and rich, and the program does an excellent job in helping to catalog and search large libraries of photos. Our greatest concern about this version relates to the division of the interface into workflow tabs. Yes, the changes were necessary for the program to remain competitive, but the way tools are spread across Manage, Compare, and View hinders an efficient run-through of photo inspection, selection, and tagging. If those limitations don’t sound like a problem to you, though, ACDSee Pro 3.0 might fit your workflow in a way that it doesn’t ours. We recommend checking out the free trial download so that you can see for yourself. ACDSee Pro continues to be an important program in a key area of photography that users often overlook, but version 3.0 is uneven in concept and execution.